According to this Black & White movie made in 1936 and based on an H.G. Wells book all of humanity will all one day be living in vast elaborate shopping malls and wear toga-like outfits with capes . . . Okay, we’re not entirely convinced about the whole cape business, but we buy the living-in-shopping malls idea as mankind already seems to be spending huge amounts of its time in them right now. In broad terms this sprawling British movie (it cost a whopping $1 million back then, the first British movie to cost that much!) manages to get a lot of predictions right when one thinks about it, right from a devastating world war that will leave Europe’s cities in ruins to an eventual mission to the moon. The date for start of the world war he got more or less right (1940) but was hopelessly wrong on the moon mission (2036!). Science fiction isn’t however about predicting the future despite what outsiders to the genre may believe. H.G. Wells’ partisan screenplay reflects both his optimistic socialist and pacifist beliefs as well as the author of The Time Machine and War of Worlds’ later frustrations with humanity’s destructive ways. In 1940 a devastating world war breaks out. It lasts until 1970 and in the process humanity reverts to backward medievalism and local warlords rule Britain. One such warlord is “The Boss” (played by Ralph Richardson) who comes across as a mixture between Hitler and Mussolini. It is up to science and the scientists to save the unwashed masses, and a group of such scientists in giant flying fortresses magically pitch up to unite Britain and lead the world into a new high-tech golden age so that by the year 2036 mankind blasts a rocket to the moon using a huge space gun. The set designs and crowd scenes are elaborate and impressive even by today’s standards. It should come as no surprise that director William Cameron Menzies was a celebrated designer in his time. Minor British composer Arthur Bliss supplied the orchestral score. However its sterile retro designs would never prove to be as influential as the cityscapes in Fritz Lang’s earlier Metropolis (1927). Pauline Kael rightly remarked that the costumes and designs looks like something out of the 1920s instead of the 1930s, the decade in which the movie was actually made. 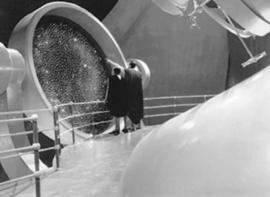 Things to Come is essential viewing today for anyone interested in the history of celluloid science fiction, but general audiences will most likely find it to be dull. The acting is often laughably bad. The fractured screenplay that leapfrogs decades through time makes it feel as if one is watching three separate half-hour movies instead of one single film. Still, the designs are fun even though the endless speechifying towards the end will make you want to nod off . . .